Akira Kamada is a sculptor and installation artist whose central concern is the impact of human behaviour on the natural environment and on our overall social fabric, combined with an artistic respect and reverence for the beauty of natural materials. Born in Japan in 1955, Kamada studied photography and painting before immigrating to Australia in 1987. While working in Sydney as a landscape gardener, specialising in contemporary Zen garden design, he studied ceramics and sculpture, and began exhibiting in group shows and public exhibitions from the early 2000s. In 2003 he was commissioned by the Art Gallery of NSW to design and construct four Japanese gardens in conjunction with the Japanese seasons exhibition, and in 2005 he was invited to join Art of Flowers and Art and About at Government House. 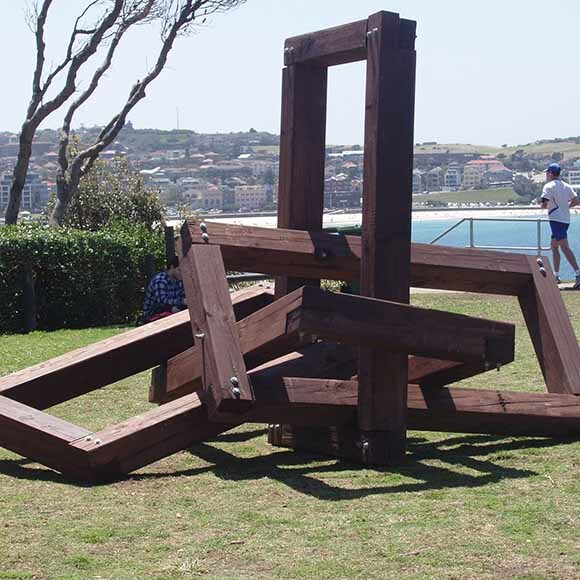 Kamada first entered Sculpture by the Sea Bondi in 2006. He has now been a finalist in the Bondi show five times, and in Sculpture by the Sea Cottesloe three times. In 2008 he received the Clitheroe Foundation Emerging Artists’ Mentor Program Scholarship. He has exhibited regularly in most major sculpture shows around Sydney and the east coast since then, receiving awards at Sculpture in the Vineyards, the North Sydney Art Prize, the Warringah Art Prize, Sculpture in the Glen, and the Jervis Bay & Basin Arts Festival, as well as being commissioned to show at ScenicWorld in Katoomba in 2016. While his early works were larger geometrical shapes, and frequently used recycled timber and/or metal, Kamada now tends to focus on more ephemeral, organically shaped, site-specific pieces and installations. Materials currently include grape vine, bamboo, textiles, twigs, pumice stone and human hair. His pieces are featured in collections at Western Sydney University (Campbelltown and Penrith campuses), Transfeld Holdings Sydney Office, Thursday Plantation, and in numerous private collections. Kamada has run many successful workshops, particularly for primary and high school students, either through direct links with schools or in conjunction with Sculpture by the Sea, Gosford Regional Art Gallery and Jervis Bay & Basin Arts. He finds this a rewarding way to contribute to the artistic life of his community.